Are you interested in Vpop but don't know where to go to find the latest hit songs? Well, you're in luck. Today, I have an easy-to-follow tutorial on downloading Vpop for noobs. It's so easy! You kids don't know how lucky you are. Back in my day, it was a chore trying to find the latest Asian pop songs. Anyone remember using Clubbox back in 2005? If you do, then you've been in this Asian pop game for too long like me. 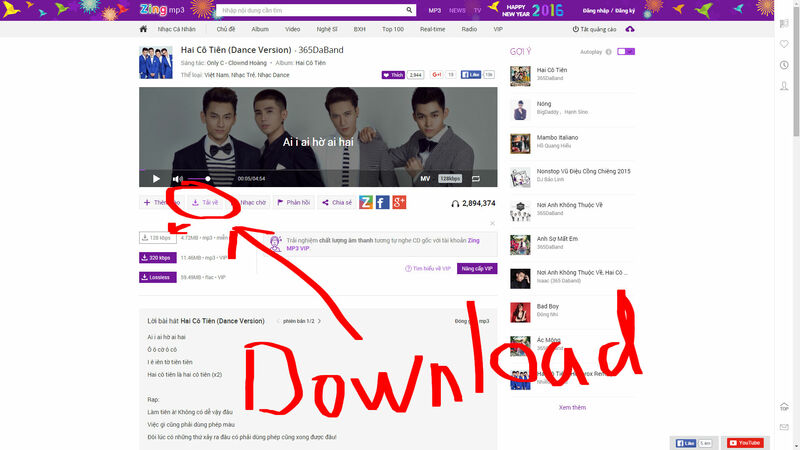 For NCT, all you have to do is click on the "Tải nhạc" download icon and then select either a 128 kbps MP3 file or a 320 kbps MP3 file. Personally, I feel 128 kbps is good enough quality for me. 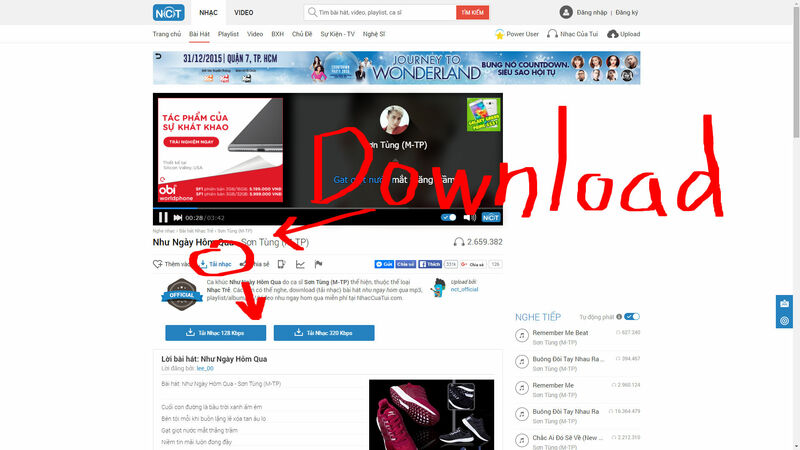 For Zing, all you have to do is click on the "Tải về" download icon and then select your MP3 file size. Again, I go with 128 kbps - miễn phí (free). For higher quality MP3's, you have to signup for VIP on the site. Between these two Vietnamese music sites, you can pretty much find every new Vpop song that comes out these days. For more underground Viet music, I would recommend checking out Soundcloud. A lot of independent and newer Vietnamese artists post their work there. For music videos, I like using YouTube. Best Websites to Stream and Download Vpop for Free Are you interested in Vpop but don't know where to go to find the latest hit songs? Well, you're in luck. Today, I have an easy-to-follow tutorial on downloading Vpop for noobs. It's so easy! You kids don't know how lucky you are. Back in my day, it was a chore trying to find the latest Asian pop songs. Anyone remember using **Clubbox** back in 2005? If you do, then you've been in this Asian pop game for too long like me. The two best sites, in my opinion, for streaming and listening to Vpop are [Nhạc Của Tui](http://www.nhaccuatui.com " target="_blank) and [Zing MP3](http://mp3.zing.vn " target="_blank). For **NCT**, all you have to do is click on the "Tải nhạc" download icon and then select either a 128 kbps MP3 file or a 320 kbps MP3 file. Personally, I feel 128 kbps is good enough quality for me. [! [www.nhaccuatui.com](http://storage.vpopfan.com/nct_download_vpop_instructions.jpg)](http://storage.vpopfan.com/nct_download_vpop_instructions.jpg) For **Zing**, all you have to do is click on the "Tải về" download icon and then select your MP3 file size. Again, I go with 128 kbps - *miễn phí (free)*. For higher quality MP3's, you have to signup for VIP on the site. [! [mp3.zing.vn](http://storage.vpopfan.com/zing_download_vpop_instructions.jpg)](http://storage.vpopfan.com/zing_download_vpop_instructions.jpg) Between these two Vietnamese music sites, you can pretty much find every new Vpop song that comes out these days. For more underground Viet music, I would recommend checking out [Soundcloud](https://soundcloud.com " target="_blank" rel="nofollow). A lot of independent and newer Vietnamese artists post their work there. For music videos, I like using [YouTube](https://www.youtube.com " target="_blank" rel="nofollow).